Alain Delon is Tony Arzenta. He is a hired gun for the mob but decides that it is time to retire in order to raise his son in a good and proper way so that it will never occur to him be drawn into the vocation of his father. Unfortunately Tony cannot be allowed to leave as he is connected and knows far too much ergo he must die but in attempting to silence Tony a mob car bomb kills Mrs Arzenta and Arzenta jr paving the way for a continent spanning stalk the Don mission of survival and revenge. Taking the story from city to city Big Guns is a visual delight thanks to Silvano Iron Prefect Ippoliti and the tale moves forward at an incredibly rapid pace. It is dramatic, extremely effective and at times nail biting. There is also room to for the occasional moment of tenderness among the brutality as Arzenta champions the downtrodden, especially put upon women, while taking a break from firing bullets into people's faces as people in his trade tend to do during office hours. 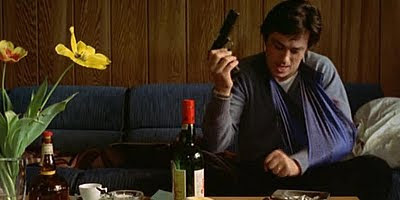 Big Guns is an essential slice of Italian and French crime cinema that is a million miles from the tough cop railing at liberal methods movie. It has an extremely strong supporting cast and under the direction of Duccio Tessari are Richard Conte, Marc Porel, Guido Alberti and the football commentator from Escape To Victory Anton Diffring. A brilliant Luciano Martino production.